In the midst of the Second World War, the growing trade deficit Canada experienced with the United States resulted in the Canadian government implementing the War Exchange Conservation Act, in an effort to stabilize the Canadian dollar (Bell 1). Canada banned all imports that were considered non-essential, deeming books and comics as luxury items (Nguyen 1). As a result, Canadian publishers began producing their own comics books, referred to as The Canadian Whites, due to their black and white interiors (Bell 1). Although the production and sale of Canadian Whites such as Active Comics, Commando Comics, and Dime Comics plummeted after the ban was lifted near the end of the war, these comics can be viewed as a portal or window to Canadian society during wartime. Superhero characters were especially popular for soldiers on front lines, representing strength and patriotism — the same characteristics associated with soldiers during the war (Babic 111). Therefore, the character representation in comics provides a glimpse at the historical attitudes and perspectives of the time in which they were produced (Babic 111). Additionally, many comics reflect the anxieties surrounding war time, including the shifting roles of women in society, fears of losing the war to Axis powers, pressure on increased production, and related issues (Babic 111). I will be examining the ways in which robots are portrayed throughout Active Comics: No. 15. 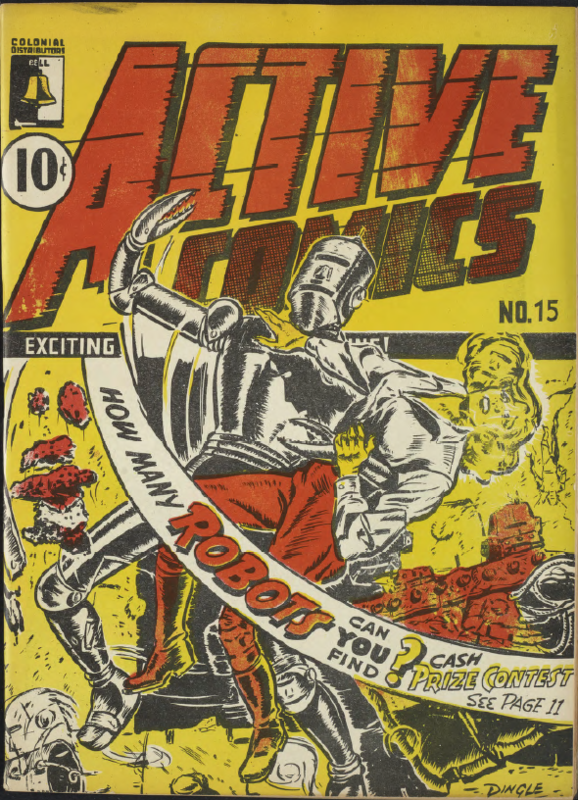 (1944), specifically three key areas: “King Fury and the Robot Menace,” (22 – 28) the front cover, as well as an activity page that prompts the reader to identify all of the hidden robots throughout the issue (11). In the same way that the public view of soldiers was associated with superhero characters, robots in the comic are much more than merely characters, they function as mirrors to the representations of Axis powers during wartime. In this essay, I will show how the portrayal of robots as mechanic, mindless followers is representative of the way Germans and other Axis powers were viewed during the Second World War, and how this portrayal was utilized in comics and newspapers in order to identify the enemy within popular discourse. Further, the identification of the robot as the enemy highlights the resemblance between the activity page and government propaganda during World War II, both instructing individuals to remain on the look out for enemies who are under the control of a dangerous leader. The term “robot” was incredibly common in public discourse and Canadian newspapers during World War II. “Robot” appears hundreds of times in The Toronto Daily Star, The Globe and Mail, Hamilton Spectator and many other news sources. Notably, in these articles the word is excessively used to describe members of the Axis powers. In an article, titled “Human Robots” by George Axelsson featured in the Globe and Mail, both the terms “civilian robots” and “a senseless robot, mechanically obeying his master’s voice” are used to describe the Germans (Axelsson 1). Comparatively, in an article in the Hamilton Spectator, Japanese soldiers are described as having the mentality of robots, completely dependant upon commanding officers and “helpless” without their guidance (“Nothing to Fear From Jap Entry; Men But Robots”). Additional terms found in articles range from “Nazi robots,” “Robots of the German airforce, [who need] a slave – driving general to tell them what to do,” to describing Germans as “slaves” and British pilots as “free men, self – reliant and ground in the dignity of manhood” (“Knights on Winged Steeds”). These terms are all degrading and speak to the lack of agency and mindlessness associated with robots, relating these attributes to the Germans and the Japanese Axis powers. Another way in which the word robot is used in these articles is in reference to the robot bomb, even coincidentally a 1944 article titled “Menace of the Robot Bomb” in the Globe and Mail. The robot bomb, created by the Germans, is essentially a pilotless bombing aircraft specifically designed to attack the British. The fact that it is pilotless, and unmanned is important as it is a machine that is set out to perform a particular task, decided by those in possession of it. Parallels are also drawn when one takes into consideration that the robot bomb is a an aerial bomb, and that in the comic “King Fury and the Robot Menace” the Germans escape with the robot menace on a soundproof plane that King Fury and the Canadian Military cannot detect (28). In the comic, the robot is considered “good” when in the possession of the Americans, and “bad” when in the possession of the Germans, indicating that the “goodness” or “success” of the machine is completely dependant upon who has control. Seeing as the Germans had predominant control of the robot bombs, and they gain control of the robot in the comic, the robot symbolizes an empty vessel for potential evil. When comparing the portrayal of robots within World War II newspapers to Active Comics, the identification of the robot as the enemy is present in the comic “King Fury and the Robot Menace” by Kurly Lipas, as well as the front cover. King Fury pays a visit to Dr. Tone and his daughter Tonee, and is welcomed by a robot identified as Dr. Tone’s newest invention (23). Dr. Tone is excited about the robot, as he can exercise his control over the robot with a remote control, stating that the government can make great use of his invention (23). It was not uncommon in the wartime for robots to be used as symbols for the portrayal of the enemy, as psychologically, many individuals associate robots with manufacturing and militarization (Cheng 1). In her analysis of Kakoudaki’s Anatomy of a Robot, Jennifer Rhee writes that robots are often a mechanical reflection/representation of our own human bodies, and our vulnerability to being controlled by forces external to us (Rhee 408). Further drawing from literary examples, Kakoudaki states that robots are often used to provide labour through elements of control, and that this relationship between the robot and the possessor brings forth notions of dehumanization, objectification and slavery (Rhee 409). In “King Fury and the Robot Menace,” this element of control is largely prevalent as the German’s overlooking Dr. Tone’s home break in to steal the robot. When they enter Dr. Tone’s home, Dr. Tone is so busy directing the robot that one of the Germans knocks him out and gains possession of the remote control. The robot then attacks King Fury and the Germans escape on a soundless plane with the robot, undetected by King Fury or the military (27). The robot in the story demonstrates no sense of agency, and surrenders completely to the individual in possession of the remote control. Control implies that the robot can be in the wrong hands, and Dr. Tone’s distraction when directing the robot to follow him as the Germans invade his home is ultimately the reason he is caught off guard and gets the remote control taken away from him. When the robot attacks Dr. Tone and King Fury as a result of this, the robot also becomes the enemy. Furthermore, the front cover of the issue features a terrified young woman in the arms of a robot that appears as though it is going to hurt her. Yet again, the robot is not captured in any positive light, and the human being is innocent and under the threat of the robot. The cover illustrates the identification of the robot as an enemy, and subsequently the fear of this enemy. Dingle, Adrian. Cover, Active Comics No. 15, January 1944, Bell Features Publishing. There is no denying a rhetorical trend in newspapers describing Axis powers as being robotic, mechanized, thoughtless, and incredibly vulnerable to external influence and control. In “King Fury and the Robot Menace,” the German agents are often being commanded. For starters, it appears as though they are on a mission to steal the robot to bring back to Germany, commanded by an authoritative figure. When in possession of the remote control, the German agent states, “It’s as if I were the robot itself” (24). Ultimately, this quote suggests a mirroring between the German agent and the robot, that is only reinforced by the reverse shot sequence of the Nazi attacking Tonee, and the robot attacking King Fury, both of them striking the other in the head (26). In this way, the robot and the German operate as one in the same. The comic creates these parallels yet again in the second last panel, when King Fury tells Tonee, “If the Nazis ever build up an army of those robots our boys would have no chance against them… somehow with my strength and God’s help, I’ll destroy the robot menace” (28). Language plays a key role here, as the comic features the heroic character King Fury, who “Utilizes his great strength to help destroy the axis dictators,” and “Pits his strength and wits against the robot menace” (22). The term “menace” used to describe the robot directly implies a negative connotation, whereas the terms “King,” “strengths” and “wits” used to describe King Fury attribute his man power to goodness, identifying King Fury as the hero. Moreover, when one of the German agents says “Dis vill be a great day for the Reich,” (in reference to the Third Reich) on the plane, the text only reaffirms the rhetoric that these men are under the control of a leader and carrying out an instructed task. 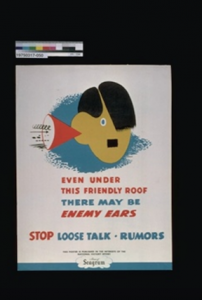 “Even Under This Friendly Roof There May Be Enemy Ears.” Wartime Security Poster, 1939 – 1945. Canadian War Museum. Seeing as the comic establishes the robot as an enemy that the protagonists fear, it is also important to note the preventative measures the comic is advocating for in resistance of these enemies, and how this is a reflection of World War II government propaganda. Comics were often directly marketed to children due to their cheap price, accessible narratives, adventure and sense of escapism (Babic 14). Many of the messages found in the comics directly correlated with the roles children had in society during that time. When the war started, new responsibilities were given to children as their parents either entered the workforce or left to fight overseas (Cook 1). Children were considered involved in the war effort, with posters around schools encouraging children to be on the lookout for spies and to avoid spilling any information or talk that would help the enemy (Cook 1). Spy work as an activity is exemplified on page 11 of Active Comics: No. 15, as the page features a competition titled, “How Many Robots can you Find on the Cover” (11). The competition asks readers to tear off the cover of the comic and circle all of the robots that they can find, looking at every “figure, tree, rock, boat, gun, etc” (11). The page illustrates the activity of being on the lookout for robots, as they may be hiding. Seeing as the robots are portrayed in a negative light throughout the entirety of the comic, the activity speaks to being perceptive and on the lookout for the enemy. The responsibility that is being put on the reader in this comic is exemplified in much of the propaganda regarding security during World War II in Canada. As demonstrated in the “Wartime Security” poster, there was a climate of fear built on the notion that the Germans were constantly listening, stating that enemy ears could be everywhere. Thus, propaganda instructed individuals to look beneath the surface, look out for enemies, and to police themselves in order to ensure national security. The comic does this in the form of a competition, but it is nevertheless the same idea of surveying others due to a fear that has been ingrained in the individual based on the idea that the enemies can be anywhere. The portrayal of the robots within the issue relates to the narratives that dominated government propaganda and newspapers at the time, tying into a much larger representation of the axis powers within the media. Just on the cover, the issue establishes the threat, featuring a woman being defeated by a robot, surrounded by rubble. The portrayal of the robot in “King Fury and the Robot Menace” as being entirely susceptible to control and whose sole purpose is as an object controlled to achieve a means to an end calls to mind the discourse of the time comparing the Germans and Japanese as being controlled by an evil leader, machine like in their actions. Robots as machine like and in the possession of the enemy can also be viewed as a symbol for the robot bombs during World War II and the climate of fear perpetuated by these pilotless bombs, used heavily by the Germans. Overall, the use of robots in Active Comics: No. 15 establishes the enemy as a looming threat, challenging the reader to search for the robots just as children and adults were told to survey those around them. The activity page, when combined with the portrayal of robots throughout the issue, suggests that the enemy was using unassuming vessels to perform dangerous tasks, that could be found everywhere and anywhere, successfully heightening the public’s paranoia towards them. Axelsson, George. “Human Robots.” Globe and Mail, 13 November 1944. Democracy at War: Canadian Newspapers and the Second World War, Canadian War Museum. Babic, Annessa Ann. Comics as History, Comics as Literature : Roles of the Comic Book in Scholarship, Society, and Entertainment, Fairleigh Dickinson University Press, 2014. ProQuest, doi: 978-1-61147-557-9. Bell, John. “Comic Books in English Canada.” The Canadian Encyclopedia. 8 July 2015. www.thecanadianencyclopedia.ca/en/article/comic-books-in-english-canada. Cook, Tim. “Canadian Children and the Second World War.” The Canadian Encyclopedia. 12 April 2016. www.thecanadianencyclopedia.ca/en/article/canadian-children-and- wwii. Cheng, Ching-Ching, Kuo-Hung Huang, and Siang-Mei Huang. “Exploring Young Children’s Images on Robots.” Advances in Mechanical Engineering, vol. 9, no. 4, 2017. ProQuest, doi: 10.1177/1687814017698663. Dingle, Adrian, et al. Active Comics: No. 15. Bell Features and Publishing Company Limited, 1944. RULA Archives and Special Collections, Ryerson University, Toronto, Canada. “Even Under This Friendly Roof There May Be Enemy Ears.” Canadian War Museum. 1939 – 1945, https://www.warmuseum.ca/collections/artifact/1019615/?q=security+poster&page_num=2&item_num=5&media_irn=4248. “Knights on Winged Steeds.” Globe and Mail, 22 August 1940. Democracy at War: Canadian Newspapers and the Second World War, Canadian War Museum. “Menace of the Robot Bomb.” Globe and Mail, 31 July 1944. Democracy at War: Canadian Newspapers and the Second World War, Canadian War Museum. Nguyen, Linda. “Artist Part of the Golden Age of Canadian Comic Books; Helped to Create this Country’s Superheroes After WWII, Designed Graphics, Logos for Products.” Toronto Star, 2006. ProQuest, https://search-proquest-com.ezproxy.lib.ryerson.ca/docview/ 439026882?pq-origsite=summon. “Nothing to Fear From Jap Entrey; Men But Robots.” Hamilton Spectator, 11 December 1941. Democracy at War: Canadian Newspapers and the Second World War, Canadian War Museum. Rhee, Jennifer. “Anatomy of a Robot: Literature, Cinema, and the Cultural Work of Artificial People by Despina Kakoudaki (Review).” Science Fiction Film and Television, vol. 10, no. 3, 2017, pp. 407-412. Project MUSE, https://muse-jhu-edu.ezproxy.lib.ryerson.ca/article/ 674425.